In Hungary there is no Santa Claus at Christmas. St. Nicholas Day -- December 6th -- is a minor secular holiday, when children put their polished shoes in the window. If they were good, St. Nicholas will fill their shoes with candy by morning, but will leave a bundle of dry twigs in the shoes of bad children, as a warning. He makes his rounds on a horse drawn sleigh, his lean frame bent under the weight of his sack. Christmas is the magic season. By Christmas Eve, the children's excitement is at a fevered pitch. Food preparation began a week ago, but tonight the Baby Jesus will bring a tree and gifts to all. Banished from home, children and their sleds congregate on every slope at near by parks, chattering excitedly in anticipation of the big night. Returning home they find that the living room door is locked and the dinner table is set. Traditional Fish Soup is usually followed by Fried Fish and the meal concludes with the festive Walnut and Poppy Seed Horseshoe, colloquially referred to as Beigli, for dessert. No one notices that the father slipped away near the end of the dinner. The doors of the living room open and there stands "The Tree". Blinking candles are reflected in the wide-open eyes of the children. Shining glass-balls, foil wrapped candies, meringue wreaths and tinsel cover the evergreen in breathtaking loveliness. Carols are sung joyously and the presents are opened. Christmas dinner is a family meal centered on Roast Goose with Red Cabbage, Tortes and Cookies. Boxing Day, the weary cook serves Stuffed Cabbage prepared the week before. Throughout the season there is much visiting, Horseshoe, Cookies, Tortes and coffee or brandy are offered to the guests. 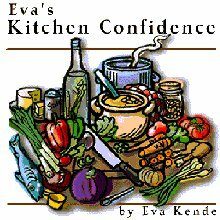 Visit Eva's web site by clicking here!